Here is a photo of the home-built VSC/ SAO Carton100mm f/13 'Mary Dawson' refractor. Construction was completed on the instrument on July 6th, 2010. Click to see an enlarged image. The VSC/ SAO Carton 100mm f/13 "Mary Dawson" refractor with Mel Dawson at the helm performing First Light on July 10th, 2010 . Click to see an enlarged image. Hello Fellow Stargazers, and ATM'ers! ...and Welcome to the web pages covering the construction of the VSC's "SAO Carton 100mm f/13 'Mary Dawson' Refractor". Though this refractor is smaller in aperture as compared to the 127mm f/9.4 "BGRP" refractor I constructed back in December, 2009, its optics are far superior. The instrument utilizes a brand new vintage 1980 mounted Carton 100mm f/13 achromatic Fraunhofer doublet, that is said to be the finest objective that Carton Optical Company of Japan had ever produced. And I must say, that all of the hoopla about these optics have held true in my experience. After spending a great deal of time with my SAO Surplus Shed 127mm f/9.4 "BGRP" refractor, I was well aware that it was not the planetary instrument I was hoping for. Yes, it was awesome from low to medium magnifications, but I longed to see greater detail on those grand outer planets we amateurs love to gaze upon so much through a refractor. 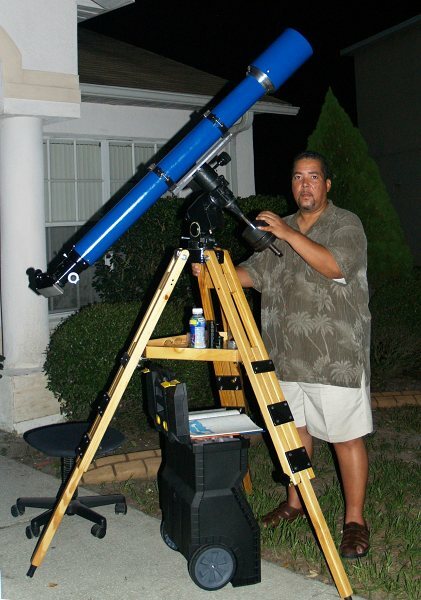 From that fresh mindset, a new drive arose for me to build a refractor for planetary and double-star use. In researching to find adequate optics, I ran across a threads on Cloudy Nights that truly sparked my interest immensely. It was start by Cloudy Nights member Doug76 regard the build of his Carton 100mm f/13. I followed along and partook in his thread. I was pleased with Doug's comments to the point that I was nearly pounced on a set of the optics immediately, but I wanted to do more research before I committed to the build. The mounted Carton 100mm f/13 Fraunhofer achromatic objectives were being sold by Sheldon Faworski, an affiliated of the now defunct Apogee, Inc. In my search I discovered a wealth of knowledge about these lens from several resources, which ultimately convinced me to purchase a set form Sheldon for $215.00. This was a fantastic price considering how much the telescopes holding this lens set was going for. The Italian based retailer "NortheK" was offer a custom built Carton 100mm f/13 refractor OTA sporting a carbon fiber tube, Crayford focuser, anodized components, and cradle rings with dovetail bar for around $1800.00!!! A testament to the true quality of this fine instrument. With that, I must say that I was not disappointed and was sold. So, I made the investment. To make this a special memorial piece, I named the scope after my dear mother, Mary Dawson, one of the main catalysts for sustainability, growth, love and well-being within my life. 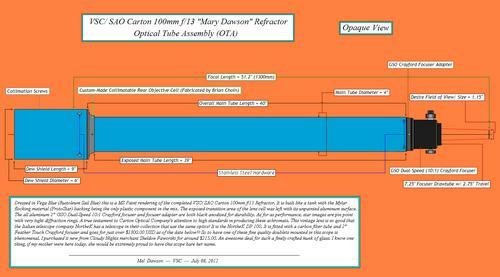 Now let's see how the VSC/ SAO Carton 100mm f/13 "Mary Dawson" refractor came to be via this construction overview. I hope each and everyone that reviews the contents of these pages will find inspiration to embark on their own telescope project. Believe me when I say that it is one of the most rewarding experiences of my life. Thanks to the prayers, strength, support of so many of you and God, I am happy to announce that I was able to perform First Light with my Carton 100mm f/13 tonight! As dusk came and the skies turned a deep teal blue at around 9:00pm EDT, my first target with the "Mary Dawson" refractor was Venus. Using a TeleVue 15mm Plossl, which yield a magnification of 87x, I slowly focused Venus in the field of view and was very pleased at the image I was seeing. Despite some purple fringing, Venus was very sharp and CA was held very, very low even though Venus was low in the sky. Typically, viewing objects that low in the sky would general tease out the CA of many a celestial object. But, the instrument held this aberration to an extreme minimum; impressive indeed! Enjoying the view, I moved up to a TeleVue 11mm Plossl. This gave me a power of 118x. At this magnification I could easily make out slight irregularities in the Venusian terminator of its gibbous phase. That was quite a sight! It was the best view I have ever seen through and refractor I have owned. Again, purple fringing was present, but in no way was it an issue. CA was practically nonexistent. Contrast was outstanding through the test. Darkness settled in good at about 10:00pm EDT, and it was time to check out some of those DSO's and Double Stars! With my good friend Gary Barabino on the other end of the phone, he suggested that I check out M13, the Hercules Cluster. The globular cluster was approaching the meridian from my vantage point and prime for viewing. I realize that the 100mm is not a light bucket; however I wanted to see what it could do on DSO's. Bright globular clusters can produce surprisingly beautiful images when put under moderate magnification. It was no surprising in the Carton. M13 was resolved to the core with ease at 87x with the TeleVue 11mm Plossl. At 118x with the TeleVue 11mm, the core sparkled like diamonds. I only wish I was out at a dark remote site to take it all in. The next DSO I chose to check out was M57, the Ring Nebular. Why the Ring Nebula? Well, I wanted to see how well the optics of this "four incher" would fair on an object that is generally viewed with large aperture telescopes. Once again, I was quite impressed with the image. The ghostly ring stood out even at 118x! Of course, seeing the central star was impossible. Nevertheless, you could make out the shape and some faint structure in the ring's nebulosity. I am really digging this scope, man! Around 10:45pm EDT, I decided to check out a couple of brightest stars. First up was Arcturus. This star produced a very tight disk with minimal flaring. Diffraction rings (two) were close to the star's disk and the color was a pale orange. Only a little purple fringing was discerned. Very nice image! Next up was Vega. Again tight diffraction rings (two) and the color appeared a brilliant blue-white. Purple fringing was a bit more prominent on Vega as compared to Arcturus, but nothing to be upset over at all. Moving on, it was time to check out a double star, and the one of choice was Epsilon Lyrae, the Double-Double. What really struck me was how tiny the disks of the stars were. Also how tight the diffraction rings were in relation to the stars. Simply amazing how small the airy disks were. I wanted to check out a few more objects, but I started to get a bit tired. So at around 11:30pm EDT, I called it a night. In conclusion, I could not have asked for a better result after tonight's First Light session with my Carton 100mm f/13 "Mary Dawson" refractor. Total success was achieved! Doug is so right to exonerate the attributes of this fine instrument the way he does. It literally produces APO like image quality, but in a larger package. However, an APO would never touch the magnification this lady could produce. I am very pleased with this instrument and will be reporting back with more observing session details in short order! If you want a telescope in the 4â€� range, get yourself one of these objectives. I saved plenty cash in building my own like many others here on this thread. But, the optical results of this refractor are worthy of telescopes costing far more. At the top of this page is a shot of me with my homebuilt Carton 100mm f/13 during the First Light session. My mom would truly be proud of this instrument, which carries her name.